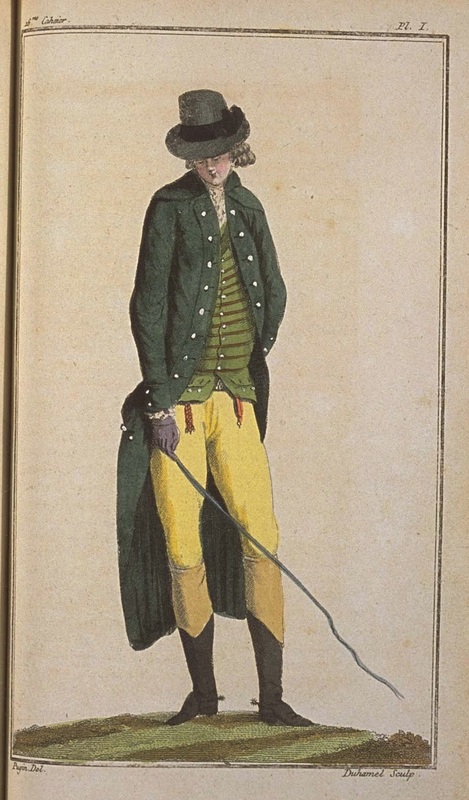 A manner of dressing to ride a horse, which is surely not less elegant than than that of our drawn Man, is that which consists of wearing well very white Breeches and a Gilet, with Boots matching those that we have described, and a Dragoon green Coat, all plain, with a scarlet lining. There is in this ensemble something that allures us. We require with this outfit a tricorn Hat, furbished à la Suisse. You can say all you like; but we find that these Hats always gave and give to those who wear them, a much more frank, much more proud, and much more decided air than all thee round Hats do. It is only in wool that these Dragoon green Coats can be made, with a scarlet lining, which must also be of wool. But wool Coats seem to be Coats for riding on horseback in all seasons. It is necessary to confess that only wool Coats clothe perfectly; and it is necessary to be well dressed for riding. Without that, beware the stable air. 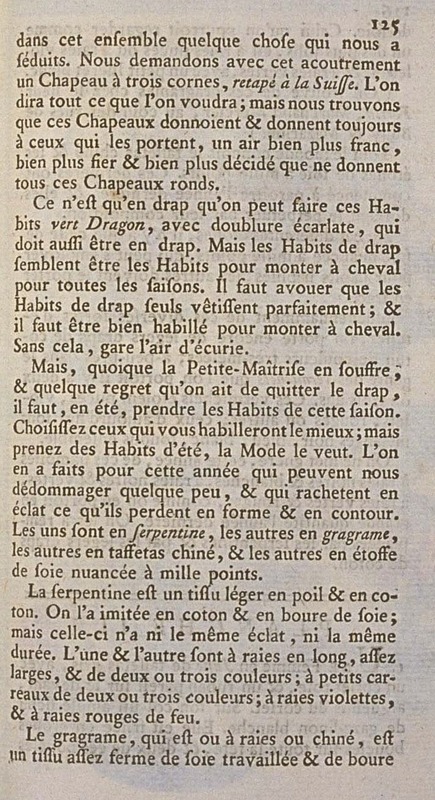 But, though the Petite-Maîtresse suffers from it, and some regret that she had to abandon wool, it is necessary, in summer, to take on Coats for this season. Choose those which dress you the best; but take summer Coats, Fashion wills it. One has made them for this year which can compensate somewhat, and which redeem in éclat what they lose in form and contour. Some are made in serpentine, others in gragrame, others in chiné taffeta, and others in silk stuff clouded with a thousand dots. Serpentine is a light fabric of hair and cotton. It has been imitated in cotton and in bourre de soie;* but these have neither the same éclat, nor the same durability. They have stripes down the length, rather wide, and in two or three colors; with little checks in two or three colors; with violet stripes, and with flame-red stripes. 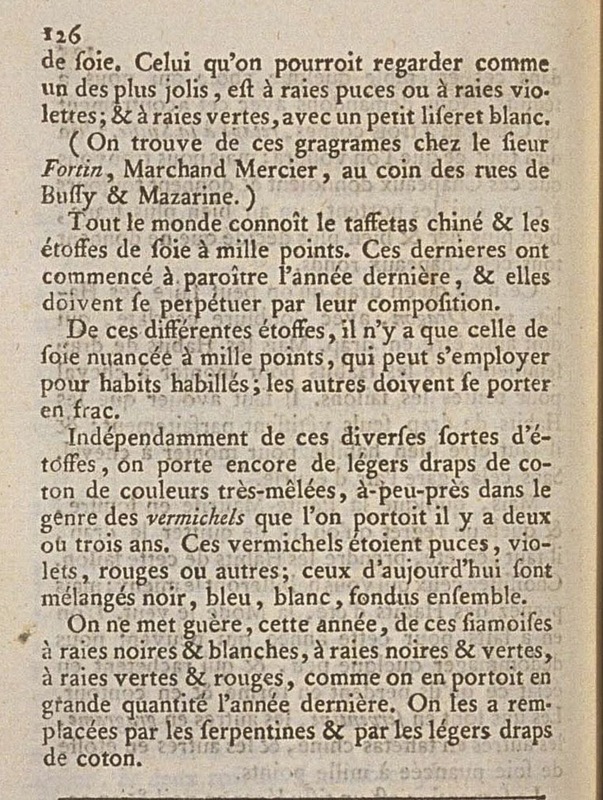 Gragrame, which is either striped or chiné, is a rather firm worked silk fabric and bourre de soie. * What could be seen as one of the prettiest, has puce stripes or violet stripes; and green stripes, with a little white edge. Everyone knows chiné taffeta and thousand-spotted silk fabrics. These latter began to be seen last year, and they must be perpetuated in their composition. Of these different fabrics, there is only that of silk shaded with a thousand dots, which can be used for full dress coats; the others should be worn for frock coats. Independently of these diverse types of fabrics, one still wears light cotton cloth of very-mixed colors, nearly of the vermicelli type that was worn two or three years ago. These vermicellis were puce, violet, red, or otherwise; those of today are mixed with black, blue, white, melted together. One hardly wears, this year, these siamoises** with black and white stripes, black and green stripes, green and red stripes, as were worn in a great quantity last year. They were replaced with the serpentines and by the light cotton cloths. * Silk made from cocoons that have not been unwound. Something like silk noil?